Christmas might have been a thing for the last two millennia but Lexmas is still in its infancy and every year it grows stronger suckling on the eggnog teet and feasting on the spirit of Jesus like a fat little sausage roll in a manger. Last year I believe Lexmas lasted a week, this year we’re doubling down and going for a full two weeks of Christmas carnage. In the biggest news of Lexmas (aside from all the excellent gigs we’ve got going on) we’ll be opening the club on Thursday 14th December to really kick off the weekend a night early. DJs will be playing a ridiculous mix of party jams, 80s pop, indie hits, 90s and of course Christmas bangers! Whilst Lexmas really kicks off on the first of December as that is the official start of the month known as Christmas and we will be open late every night as usual, the real Christmas carnage begins on Monday 11th December when we’ll be open til 3am! Then we’re open til 3am every night with DJs in the main bar playing the hits. We’ll be open 4am on the weekends with clubnights upstairs too! The result will be FOURTEEN Saturday nights in a row including clubnights with White Heat and the 80s bangerthon that is Age of Consent. Then, sadly, we must leave you to wallow hungover and deafened before reappearing on Thursday 29th for our annual festive Telegram gig, White Heat taking you back to 2008 and the golden age of indie on Friday 29th, Disorder’s particularly disordered indie disco on the 30th before the absolute carnage of NYE, with two floors of lasers, glitter cannons, broken resolutions and party tunes from White Heat. NYE has an annual habit of selling out before the day so don’t sleep on tickets if you want to welcome in the new year with the White Heat boys playing all the hits and more! Wednesday 13th – Both floors til 3am with Feeling Gloomy DJs upstairs! Thursday 14th – Both floors till 4am! Friday 15th – Both floors till 4am! White Heat Club upstairs! Saturday 16th – Both floors till 4am! 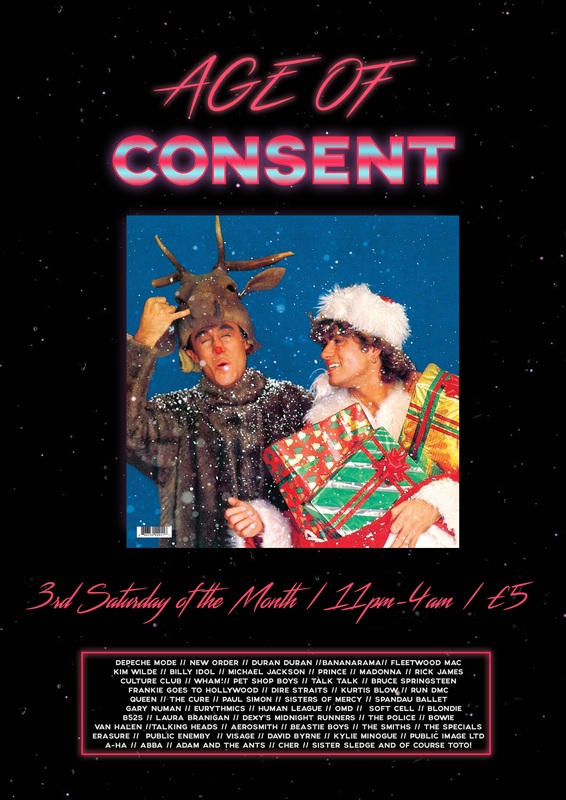 Age of Consent – 80s / New Wave / New Romantic Xmas Special! Friday 22nd – Both floors till 4am! White Heat Club upstairs! Monday 25th – MERRY CHRISTMAS! Thursday 28th – Open til 4am! Friday 29th – Both floors till 4am! White Heat Club upstairs! Saturday 30th – Both floors till 4am! Disorder Club upstairs! 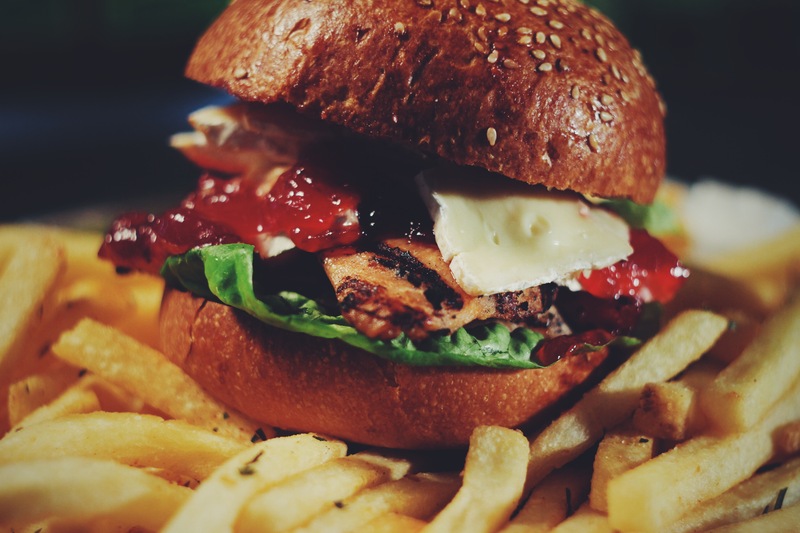 And we have also been told that our kitchen pop-up GoneBurger have a few festive tricks up their sleeves, so keep an eye on our facebook because this will be making an appearance soon!